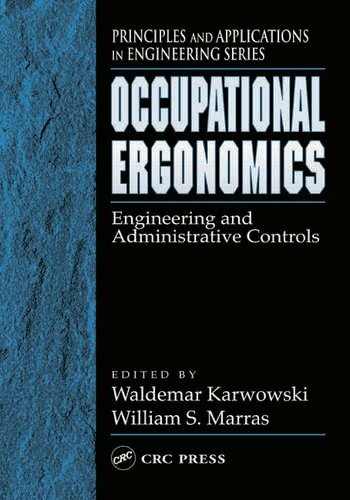 Occupational Ergonomics: Engineering and Administrative Controls focuses on prevention of work-related musculoskeletal disorders with an emphasis on engineering and administrative controls. Section I provides knowledge about risk factors for upper and lower extremities at work, while Section II concentrates on risk factors for work-related low back disorders. Section III discusses fundamentals of surveillance of musculoskeletal disorders, requirements for surveillance database systems, OSHA Record keeping system, and surveillance methods based on the assessment of body discomfort. Section IV focuses on medical management of work-related musculoskeletal disorders, including programs for post-injury management, testing of physical ability for employment decisions, assessment of worker strength and other functional capacities, and applications of ergonomics knowledge in rehabilitation. Epidemiology of Upper Extremity Disorders. Integrated Analysis of Upper Extremity Disorders. Biomechanical Aspects of CTDs. Occupational Risk Factors for Shoulder Disorders. Hand Tools. Gloves. Industrial Mats. Ergonomic Principles Applied to the Prevention of Injuries to the Lower Extremity. Ergonomics of the Foot. Epidemiology of Back Pain in Industry. Static Biomechanical Modeling in Manual Lifting. Dynamic Low Back Models. Selection of 2-D and 3-D Biomechanical Spine Models. Quantitative Assessment of Trunk Performance. Perspective on Industrial low Back Pain. Revised NIOSH Lifting Equation. A Population-Based Load Threshold Limit (LTL) for Manual Lifting Tasks Performed by Males and Females. Occupational Low Back Disorder Risk Assessment Using the Lumbar Motion Monitor. Prevention of Musculoskeletal Disorders. The Relative Importance of Biomechanical and Psychosocial Factors in Low Back Injuries. Low Back Pain (LBP) Glossary. Fundamentals of Surveillance for Work-Related Musculoskeletal Disorders. Injury Surveillance Database Systems. OSHA Recordkeeping. Body Discomfort Assessment Tools. Medical Management of Work-Related Musculoskeletal Disorders. 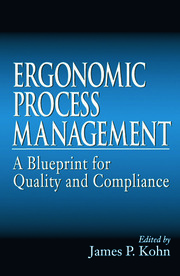 Ergonomic Programs in Post Injury Management. Physical Ability Testing for Employment Decision Purposes. Preplacement Strength Screening. Assessment of Worker Functional Capacities. 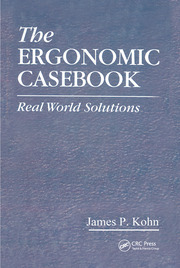 Ergonomics and Rehabilitation. Update on the Use of Back Belts in Industry. The Influence of Psychosocial Factors on Sickness Absence. Back Pain in the Workplace. Upper Extremity Support.